Hello Islanders! We've been on the same dedicated server since late 2009, and we've thoroughly outgrown it. This weekend we'll be packing our bags, saying a final tearful farewell, promising to write, and moving to a fancy new machine ten feet down the hall. I'll be performing the changeover on Saturday morning EDT, the 27th of May, a week from today. Due to timezone differences, the changeover will probably begin mid-afternoon UTC. Throughout the process, the Island and the Enquirer will be down. You can get updates on the process by following our Mastodon account at https://mastodon.social/@ImprobableIsland. If there's important news, it'll get crossposted to our Twitter account at https://twitter.com/improbableislnd, or our Facebook page. After the move is complete, we'll no longer be using our Twitter account. It'll take all afternoon to transfer player data to the new machine. 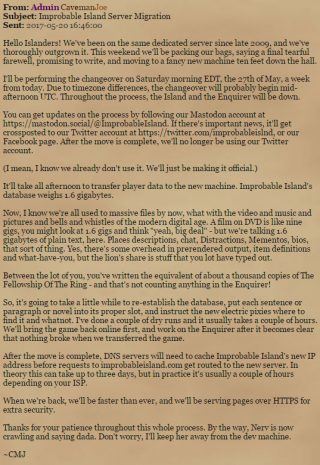 Improbable Island's database weighs 1.6 gigabytes. Now, I know we're all used to massive files by now, what with the video and music and pictures and bells and whistles of the modern digital age. A film on DVD is like nine gigs, you might look at 1.6 gigs and think "yeah, big deal" - but we're talking 1.6 gigabytes of plain text, here. Places descriptions, chat, Distractions, Mementos, bios, that sort of thing. Yes, there's some overhead in prerendered output, item definitions and what-have-you, but the lion's share is stuff that you lot have typed out. Between the lot of you, you've written the equivalent of about a thousand copies of The Fellowship Of The Ring - and that's not counting anything in the Enquirer! So, it's going to take a little while to re-establish the database, put each sentence or paragraph or novel into its proper slot, and instruct the new electric pixies where to find it and whatnot. I've done a couple of dry runs and it usually takes a couple of hours. We'll bring the game back online first, and work on the Enquirer after it becomes clear that nothing broke when we transferred the game. After the move is complete, DNS servers will need to cache Improbable Island's new IP address before requests to improbableisland.com get routed to the new server. In theory this can take up to three days, but in practice it's usually a couple of hours depending on your ISP. When we're back, we'll be faster than ever, and we'll be serving pages over HTTPS for extra security. Thanks for your patience throughout this whole process. By the way, Nerv is now crawling and saying dada. Don't worry, I'll keep her away from the dev machine.